WHAT: Special Sessions at the annual meeting. HOW: Look for special sign-up opportunities during annual meeting registration. 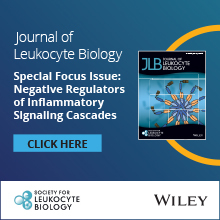 WHAT: Journal of Leukocyte Biology. HOW: Received a complimentary online subscription with your membership and discounted print subscription options. Consider submitting your manuscript today to this cornerstone of the society and receive discounted page charges. WHAT: iSLB. HOW: Submit an article and read the latest issue of this newsletter that is so much more than the typical society newsletter. WHAT: Awards. HOW: Apply during abstract submission for the 2019 meeting. Many awards are available for researchers at many levels. Don’t leave money on the table! Apply for 2019. WHAT: Annual Meeting. HOW: Register to take advantage of the discounted rate. Registration is now open. 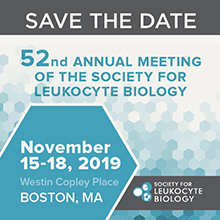 Mark your calendars for Tissue Specific Immunity: Translating Our Discoveries, November 15-18, 2019 in Boston, MA. WHAT: SLB Website. HOW: Visit the website, enjoy the multimedia features, explore the valuable resources and even look for jobs. While logged in, update your profile so other members with similar interests can find you for collaborations via our new community circle feature. SLB is your society so please look for opportunities to get involved. If you'd like to serve as a volunteer on a committee or task force, please send an email to get connected.